Chichén Itzá is the most important archaeological place of the pre-Columbian Maya civilization in the Yucatan Peninsula of Mexico and one of the most visited tourist destinations in this Country. It was granted World Heritage Site status in 1988 by UNESCO World Heritage Site and was short time ago selected as one of the New Seven Wonders of the World. Teotihuacan known as the City of the Gods, is an Aztec archeological site 40 km northeast of Mexico City. Náhuatl for "the place where men became gods", Teotihuacan is the place where you can find some of the largest ancient pyramids in the world. According to legend, it was at this point where the gods gathered to plan the creation of man. Cancun, placed to the southeast of Mexico, is the most important tourist destination, and also it is the most visited and most luxurious resort: over 2 million people arrive here yearly. The local environment is amazing and the sea here is ideal for swimming and water activities. 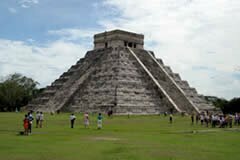 Nearby are some of the most fantastic archaeological wonders of Mexico. The best of features culture, history and amusement for kids. The city has unique monuments and scenes that confront the passage of the years. If you want tranquility, peaceful days to enjoy the sand and the sun, Cancun brags some of the most beautiful beaches in the world. The city offers an immense colonial architecture, comprising the Santo Domingo Temple, the Rufino Tamayo Museum of Prehispanic Art, etc. 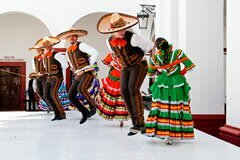 The fort of San Diego is the most excellent historical monument of the Acapulco harbor and the more important fort all along the Pacific Ocean. It is a beautiful historical and colonial city, popular not only for being a gorgeous colonial city with baroque temples and magnificent mansions.